Dubai, UAE, 25 March 2019: Dubai's favourite celebration of movement – Core Beats – is back for its second, free-to-attend edition of 2019 at Club Vista Mare at Palm Jumeirah on Saturday 30 March. 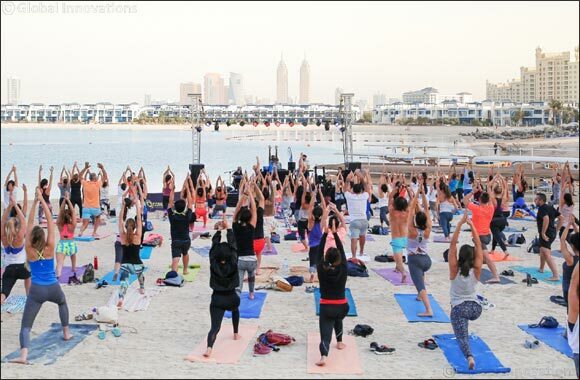 Participants will experience immersive yoga and high-intensity interval training (HIIT) workouts at the vibrant beachfront destination, guided by experts from Dubai's top studios Yoga La Vie and Barry's Bootcamp. Club Vista Mare's Core Beats free fitness concert series has been a huge hit since its launch last year, hosting over 2,000 participants so far. Set against a backdrop of spectacular views, the upcoming concert features adrenaline-charged beach workouts to R&B music and a live performance by celebrated DJ Adam J. Fitness Beats will start at 4pm, with a 60-minute calorie-busting, HIIT workout with fitness rock stars, Jade Blackmore (@JadeLimitlessTraining), Andrey Bezruk (@drey_pt) and Taylor Walsh (@TaylorWalsh406). Yoga Beats will follow at 5pm with yoga gurus, Vanessa Roux (@YogaGypsyWarrior), Nitia Krishna (@nitaiyog) and Soniya Mehra (@ThePixieTribe). Participants can also enjoy exquisite dining offers at selected Club Vista Mare restaurants to refuel after the Core Beats sessions. Breeze Beach Grill is offering a 20 per cent discount on the total food and beverage bill and complimentary beach access, while Aji has 20 per cent off drinks and delicious Peruvian-Japanese cuisines. Core Beats is held in collaboration with Core Direction, Dubai's leading fitness, health and wellness online platform. Concert attendees must bring a personal yoga mat or beach towel, and a water bottle to the workout sessions.